Line base and sides of a 20 x 30cm (base measurement) slice pan with baking paper. Process biscuits in a food processor until finely crushed. Add butter and process until well combined. Transfer to prepared pan. Use a straight-sided glass to spread and press the mixture firmly over base. Place in the fridge for 30 minutes to chill. Spread melted dark chocolate over biscuit base. Place in fridge to chill. To make the fudge, place the white chocolate in a heatproof bowl. Melt the butter in a small saucepan over low heat. Add the condensed milk and cook, stirring constantly, for 2-3 minutes or until mixture is hot (be careful not to burn the mixture as it can easily catch on the base of the pan). Pour mixture over the white chocolate. Add vanilla and stir gently until chocolate melts. Stir in peanuts. Pour over base. Place in fridge for 2-3 hours or until firm. To make caramel, heat cream in a saucepan over medium heat until almost to the boil. Stir the sugar, water and glucose in a saucepan over low heat for 5 minutes or until the sugar dissolves. Increase heat to high. Bring to the boil. Boil, without stirring, brushing down the side of the pan occasionally with a wet pastry brush, for 12-15 minutes or until golden. Remove caramel from the heat. Carefully stir the cream into the caramel. Return mixture to medium heat, and cook, stirring constantly, for 1-2 minutes or until smooth. Set aside for 30 minutes to cool slightly. Stir in the butter until melted and well combined. Pour over the fudge. Place in fridge for 3 hours or until firm. Place the milk chocolate and oil in a small microwave-safe bowl. Cook, stirring every 30 seconds, on high for 1 1/2 minutes or until smooth. 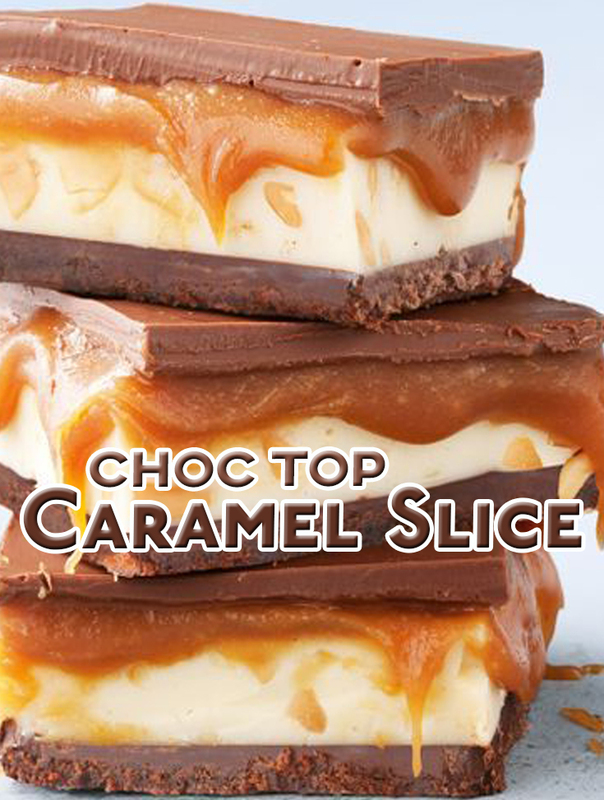 Spread evenly over the caramel to cover. Place in the fridge for 20 minutes to set. Remove from the pan and use a hot sharp knife to cut into squares. The caramel will get gooey on sitting.